Lessons are loads of fun! The Hibiscus Coast Rock'n'Club lessons cater from beginners, right to advanced and even triples! Lessons take place every Tuesday night, from 7.00pm - 8.00pm at Whangaparaoa Citizens and Ratepayers Hall - 707 Whangaparaoa Road (right next to the Westpac Bank). See the map. Flat Rate of $5.00 per lesson. These prices are inclusive of GST and may be subject to change. Beginners lessons ONLY may be repeated at no extra charge for club members. Family Concession consist of two adults and two children only. To take the Advanced Lessons you must have completed a Beginners and Intermediate course at Hibiscus Coast Rock & Roll and be a current financial member. After your lesson, you are welcome and encouraged to stay and join us for a night of dancing! Social dancing follows lessons 8.00pm to 10.30pm - Practise new moves and meet new friends! No charge for those who have paid for lessons. Help us to get to know you! We encourage all people to wear a name tag at our lessons. Enter your firstname in the space below and then click the print button. Cut out your label and bring it along to the lesson. At the door ask for a name tag holder. For more information about our Rock'n'Roll lessons, please contact us. 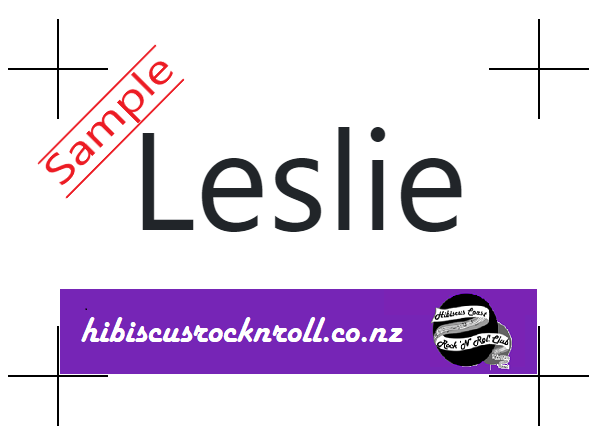 © 2008-2019 Hibiscus Coast Rock'n'Roll Club, All Rights Reserved.